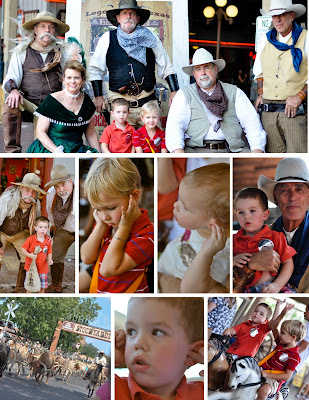 We met up with our good friends, The Tims, in Grapevine, TX for Labor Day weekend this year. We rented a 1940's house that was perfect for our stay...aside from a little plumbing problem the first night that the owner had taken care of the next day. We got there Friday night, got settled, enjoyed some delicious pizza from a local place down the road, and spent the evening catching up. Saturday morning, we enjoyed relaxing a little before getting everyone ready and heading to Grapevine Mills Mall with the intention of taking the kids to Legoland or the aquarium. The mall opened at 10. We arrived at 10:15 to discover long lines for both places. We were told it would probably be 5:30 before we could get in, so we came up with plan B! We bought tickets to come back on Monday and decided to let the kids ride the carousel and go to Build-a-Bear, which was a hit! Then the dads graciously took the kids back to the house for a nap while Barbara and I did some power shopping. 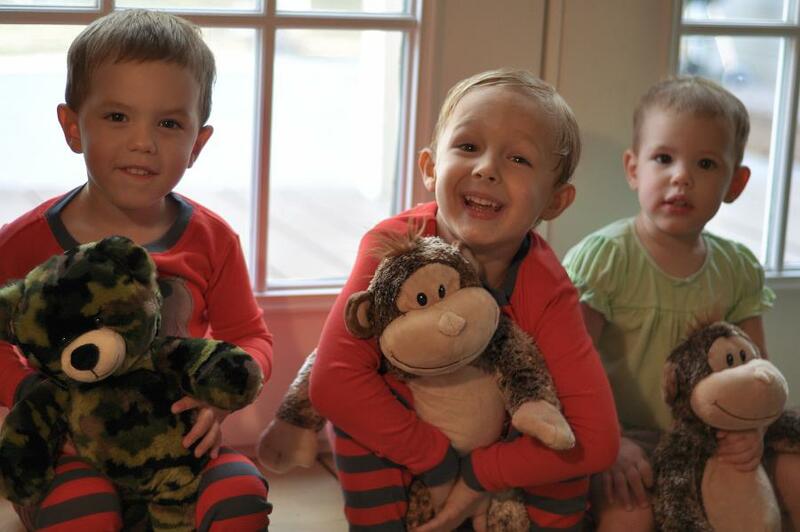 We got the boys some matching pajamas for that night, which they loved. 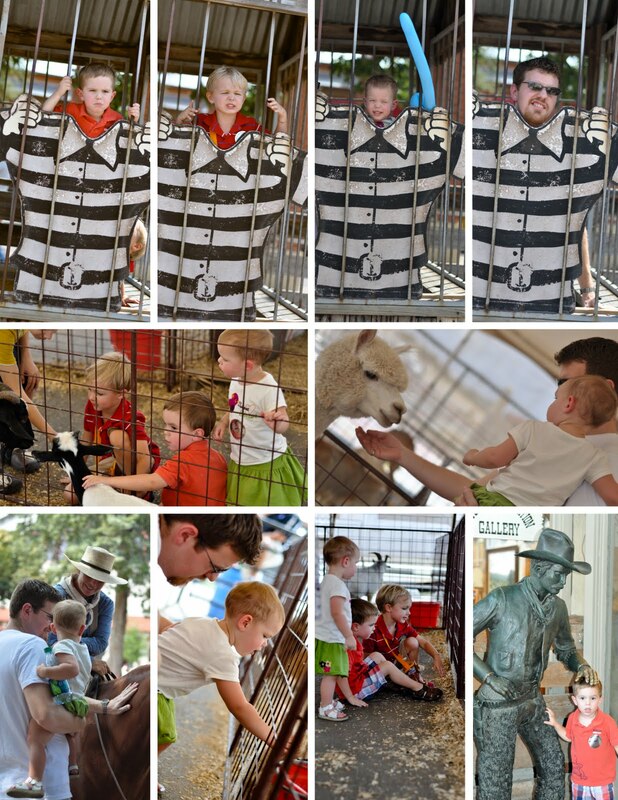 Here's a shot of the kiddos with their animals, which were named Hunter, Mr. Giggles, and Ah-Ah. Heath cooked breakfast for us Sunday morning, and we just let the kids play. Then we made our way to the Grapevine Vintage Railroad where we rode in one of the old, Victorian cars to the Stockyards in Fort Worth. It was a 1.5 hour ride one way, and the kids did really well. 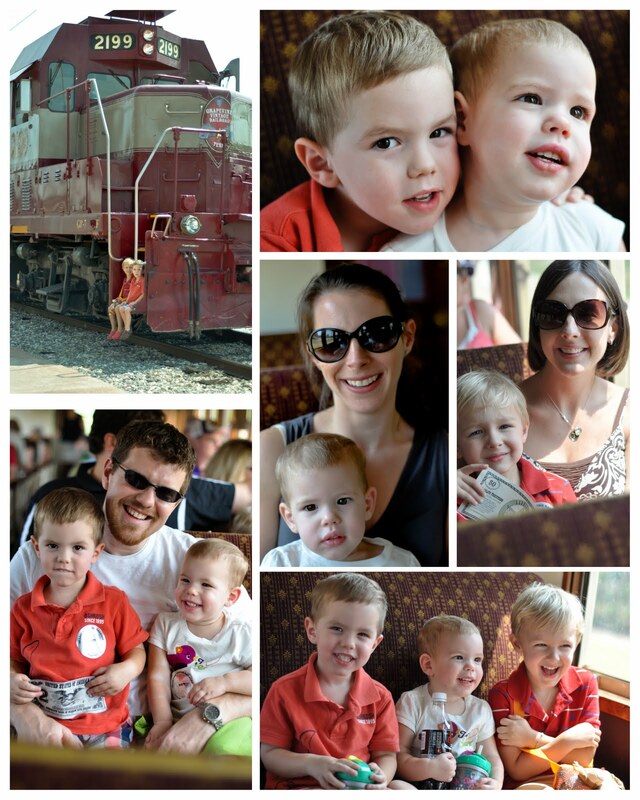 Their attention was captured by the cowboys that were "robbing" the train! Who knew you'd be given money and a badge when you were robbed on a train? 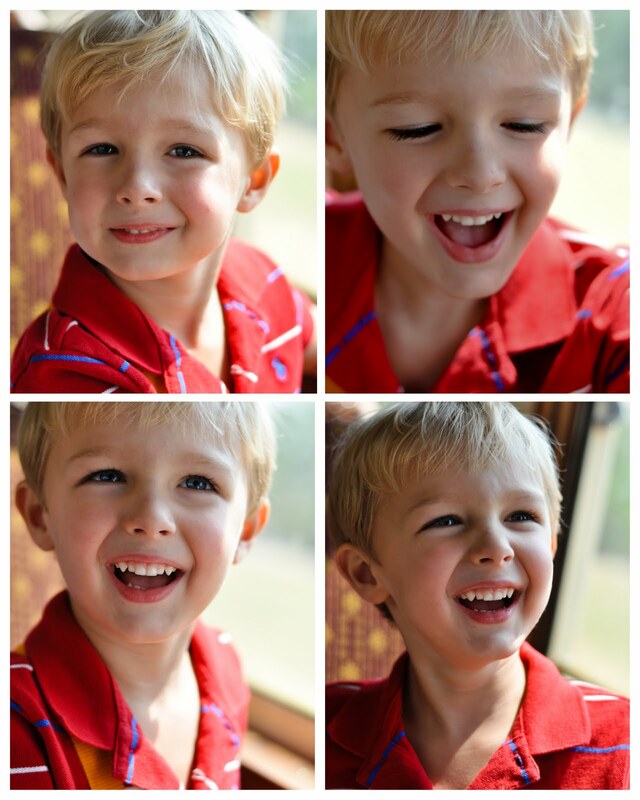 Here are a few of my favorites of Carter on the train. 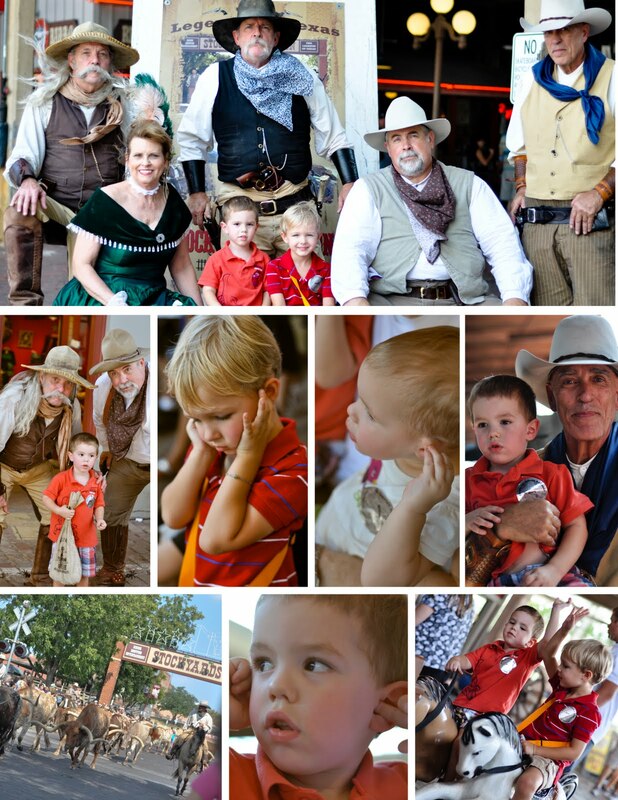 The Stockyards were filled with fun. There were rodeo clowns making balloon animals (or swords in our case), a petting zoo, a "jail", and of course, some longhorn cattle amidst all of the stores and restaurants. Each of the kids made their best mad, prisoner face in the jail including Ross. After watching the cowboys drive the cattle down the street, we watched a gun fight between the local marshall and some riff-raff. The guns were a little loud for our kiddos, but they really enjoyed it despite being startled. The marshall killed the riff-raff at the end, and I think Jackson felt bad for them because he decided they needed a hug, which they gratefully accepted. In return they gave him a spent shell, which he loved! The next morning we loaded up our stuff and headed back to the mall to get in line for Legoland. The timing worked out perfectly, and we had a blast on the rides, watching 4-D movies, and of course, playing with legos! I didn't bring my camera with me to Legoland, but it was a lot of fun. Jackson and Ross made a car and tested it on the ramps while Audrey played with big, soft legos. We left at lunch time and headed home. The kiddos crashed while eating, and we had a good trip home despite having to make a slight detour for a wildfire in the median of I-45. We saw 3 wildfires on our way home, and two of them looked very serious. It made all of the news feel much more real to be so close to some of the devastation...praying for everyone involved, as well as for some much needed rain!! !